Loudness Processing Examples: Here are examples of some of the different processes you might use to match the loudness of your mixes to commercial reference tracks. This mix (Ex19.01:WAV/MP3 ) has a lot of detail in it, and also some deliberate buss compression 'pumping', but no loudness-enhancement processing. Now listen to these loudness-enhanced versions: with 'top-down' squeeze (full-band Ex19.02:WAV/MP3 ; multi-band Ex19.03:WAV/MP3 ); with 'bottom-up' squeeze (full-band Ex19.04:WAV/MP3 ; multi-band Ex19.05:WAV/MP3 ); with limiting (full-band Ex19.06:WAV/MP3 ; multi-band Ex19.07:WAV/MP3 ); with subtle multi-band distortion (Ex19.08:WAV/MP3 ); with digital clipping (Ex19.09:WAV/MP3 ). Note that the digital peak level for all these files is identical (-0.3dBFS), so any subjective loudness differences are independent of peak level. To assess the undesirable side-effects of these loudness-enhancement processes most effectively, line up the WAV files in your DAW system and then make sure to match their subjective loudnesses (by adjusting the channel faders) before switching between them. Automation For Long-term Mix Dynamics: To demonstrate the need for automation to adjust effects levels between sections, listen first to this dry mix (Ex19.10:WAV/MP3 ). Applying effects levels suitable for the more thickly textured chorus section leaves the preceding verse sounding swamped (Ex19.11:WAV/MP3 ), whereas reducing the effects levels for the verse using automation (Ex19.12:WAV/MP3 ) means that the verse sounds closer, therefore demanding more attention, while the chorus can then arrive with more authority by virtue of sounding more expansive. Creating Build-up With Arrangement Techniques: This Mix Rescue featured an unusually long build-up during its outro section. For the remix, much of this build-up was created using a progressively more complex guitar arrangement, which I've isolated in this file (Ex19.13:WAV/MP3 ). Now that you've heard it on its own, check out how it works in the context of the completed remix (Ex19.14:WAV/MP3 ). Intelligent Trouble-shooting With Automation: This acoustic guitar part has over-prominent fret noise (Ex19.15:WAV/MP3 ), which can be remedied surprisingly effectively with an automated EQ band (Ex19.16:WAV/MP3 ). This one, on the other hand, has sporadic soundhole 'boom' (Ex19.17:WAV/MP3 ), and this unevenness can be dealt with using automated EQ notches (Ex19.18:WAV/MP3 ). Perfecting The Mix Balance With Automation: The foremost use of automation for fine balancing has got to be in relation to lead vocals, in order to maximise intelligibility. To understand what this means in practice, compare this mix without detailed vocal rides (Ex19.19:WAV/MP3 ) with this version where the vocal level has been automated extensively (Ex19.20:WAV/MP3 ) -- it's not as consistently upfront-sounding, despite heavy compression, because the processing isn't intelligent enough to judge how audible the vocal needs to be within the context of the mix. It's also not uncommon for dynamic tonal changes to creep into vocal recordings (for example if the singer moves relative to the microphone while performing), and in vocal-led mixes both fader and EQ automation may therefore be called for. In this Mix Rescue, for instance, in addition to my usual fader rides I also automated the gain control of a very broad high-frequency peaking filter centred at 7.6kHz to really lock the vocals subjective position in the balance. Here's a section of that final mix with the fader and EQ automation active (Ex19.35:WAV/MP3 ) and with both bypassed (Ex19.36:WAV/MP3 ). The effect of just the EQ rides can be heard in isolation in the following lead-vocal examples from this Mix Rescue (with EQ automation Ex19.37:WAV/MP3 ; without EQ automation Ex19.38:WAV/MP3 ). Vocal effects levels are also often automated both for balance and to make an artistic statement. This Mix Rescue features a good middle-of-the-road example of this kind of automation. This is the isolated lead vocal, complete with its automated send effects (Ex19.21:WAV/MP3 ), and here's the effects returns on their own (Ex19.22:WAV/MP3 ) so you can hear the automation more clearly. Now listen to how these effects rides work within the context of the final remix (Ex19.23:WAV/MP3 ). This Mix Rescue features a more extreme special-effect application, where automated delay (Ex19.24:WAV/MP3 ) and reverb (Ex19.25:WAV/MP3 ) create an arresting combination. Although vocals often claim the lion's share of detailed rides, other instruments do also benefit from them. For example, here's a practical demonstration of the Andy Wallace-inspired cymbal rides mentioned in the book (without automation Ex19.26:WAV/MP3 ; with automation Ex19.27:WAV/MP3 ). Mix Revisions: This Mix Rescue illustrates how a client's rejection of your first mix can help provide the information you need to deliver a more acceptable second version. In this case, although the first version (Ex19.28:WAV/MP3 ) wasn't 'wrong' from a technical standpoint, it was at odds with the artist's own sonic ideals. Discussing what was wrong with this version clarified the brief significantly, and the second version (Ex19.29:WAV/MP3 ) met with the artist's approval. A more extended example of this revision/feedback process can be found in this Mix Rescue, where the harp part went through five different versions (Ex19.30:WAV/MP3 ; Ex19.31:WAV/MP3 ; Ex19.32:WAV/MP3 ; Ex19.33:WAV/MP3 ; Ex19.34:WAV/MP3 ) before it hit the mark! Affordable Plug-ins For Mastering-style Loudness Matching: I've already mentioned masses of plug-in contenders in the other resources pages, but my own personal freeware favourites are George Yohng W1 32-bit and GVST GClip . A couple of good affordable payware options I've also used a lot are IK Multimedia's Brickwall Limiter (particularly its 'Advanced 1' and 'Clean' algorithms) and ToneBoosters TB Barricade . If you want to get a bit more serious about your home mastering (particularly with regards to adding subtle distortion components), then check out Izotope's excellent-value Ozone . Another bit of affordable software I find very useful for comparing mix tonalities is Harbal . Freeware Vocal Rider Plug-in: Back in I June 2010 wrote this Cubase tutorial showing a way of implementing something of the functionality of the Waves Vocal Rider plug-in using bundled plug-ins. One reader of that article, Terry West, decided to consolidate that workaround into a dedicated VST plug-in so that it could be used in other DAWs, and the result is his Vocal Rider. Celebrated Buss Compressors: This article lists a good number of the most celebrated buss compressors, and provides a reference point when selecting suitable master-buss plug-ins for your own mix work, especially if you have access to a library of digitally emulated classic compressors, perhaps via Universal Audio's UAD2 , Focusrite's Liquid Mix , URS Console Strip Pro , Acustica Nebula , or one of the Waves plug-in bundles. The 'Loudness War' Debate: Here are a few good sites if you're interested in the so-called 'Loudness War': Turn Me Up, Pleasurize Music Foundation. At the last of these you can also download (in return for a small donation) a great off-line dynamic-range metering utility. Here's another very thought-provoking article on the subject. What To Expect From Mastering: It's my opinion that most small-studio mix engineers expect too much from mastering, a point which I felt was well illustrated in Sound On Sound's Online Mastering Services Shootout, with its follow-up Blind Test Results and SOS forum polls (poll 1, poll 2, poll 3. All the audio files were also available on this DVD at the time -- if you can track down a copy of that it makes very interesting listening. This Mix Rescue article also provides a good perspective on what mastering's really about, especially as far as project-studio productions are concerned. 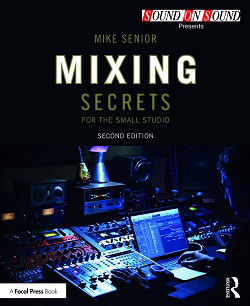 Demo-chasing & Mix Revisions: In this Mix Rescue I provide some advice on 'chasing the demo' at mixdown, and here some other Mix Rescues where I talk about dealing with mix revision requests article 1, article 2, article 3. Mix Automation In Practice: Here are some Mix Rescues where I focus on different aspects of detailed level automation: article 1, article 2.